Native to Central and Eastern China. Related species include carnation, baby’s breath, lychnis, silene, Sweet William. Plant is a biennial or short-lived perennial. Flowers are 1 inch across, some forms with fringed petals, some with contrasting eye. 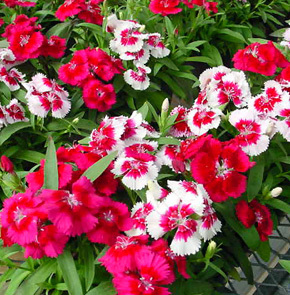 In Greek, “dianthus” means the flower of Jove. ‘Heddewigii’ is a group of compact, free flowering cultivars derived from this species. Some favorite cultivars and their respective flower colors include ‘Duke’ (rose, crimson, violet) and ‘Princess’ (crimson, pink, purple, salmon, scarlet, white).